Don’t let water accumulate around your foundation! Fix those faulty rain gutters now. Gutter end caps and connections can come loose over time, causing leaks. 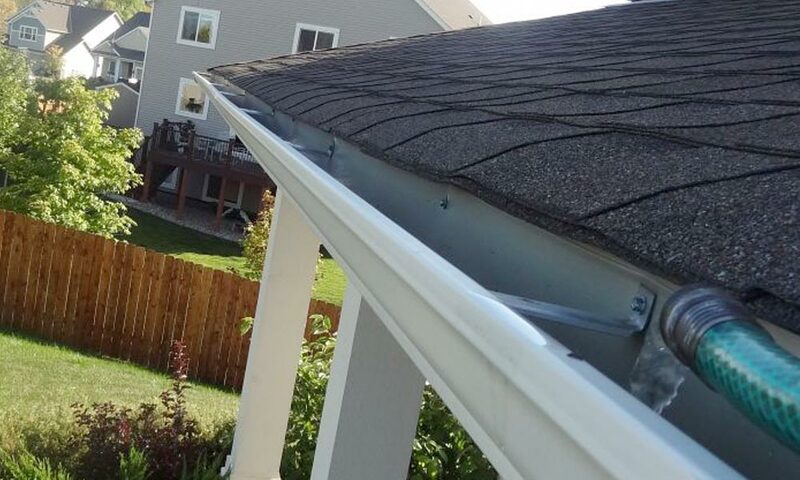 Gutters can also pull away from the fascia, negating their ability to catch and channel rainwater. 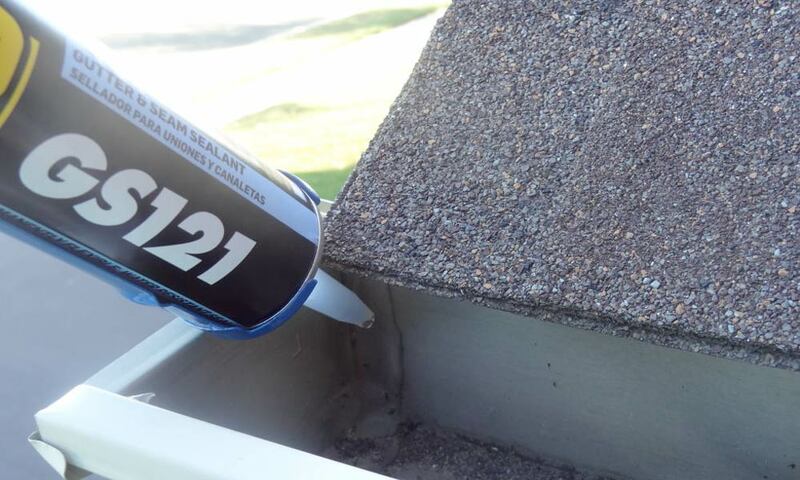 Brett Martin shows you how to repair your gutters so they function like the day they were installed. During the chaos of a rainstorm, it can be difficult to tell where the gutters are actually leaking. Rainwater gets blown against the face of the gutters, resulting in myriad drips along the entire length of the gutter. 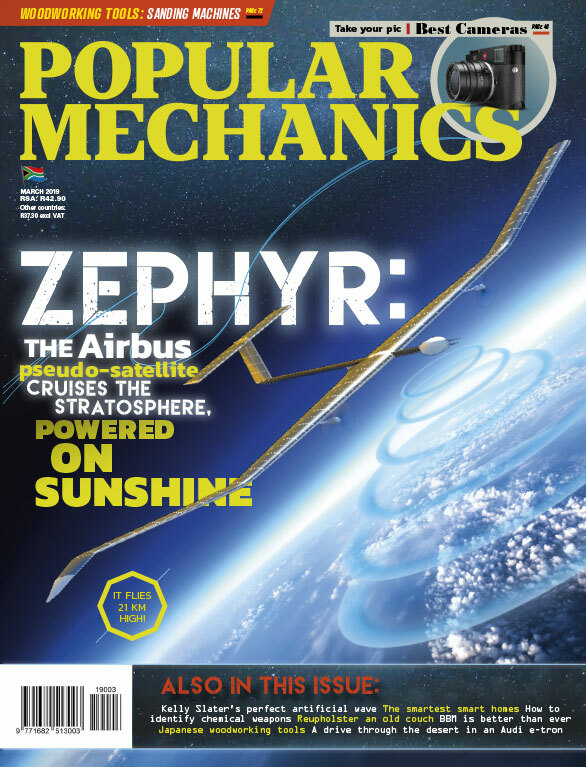 To pinpoint leaks, go out on a nice day instead. Stick your garden hose inside the gutter, turn on the water, then look for leaks. Tip: If you’re not keen on using clean water, consider using grey water from the shower. Water rushing against the caps at the end of gutters can push them loose. A little separation is all it takes for a leak. 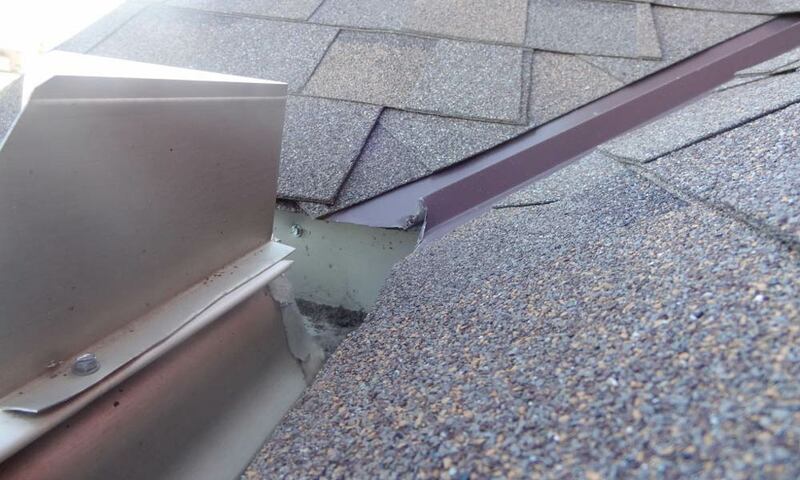 If this is your problem, then you need gutter sealant. 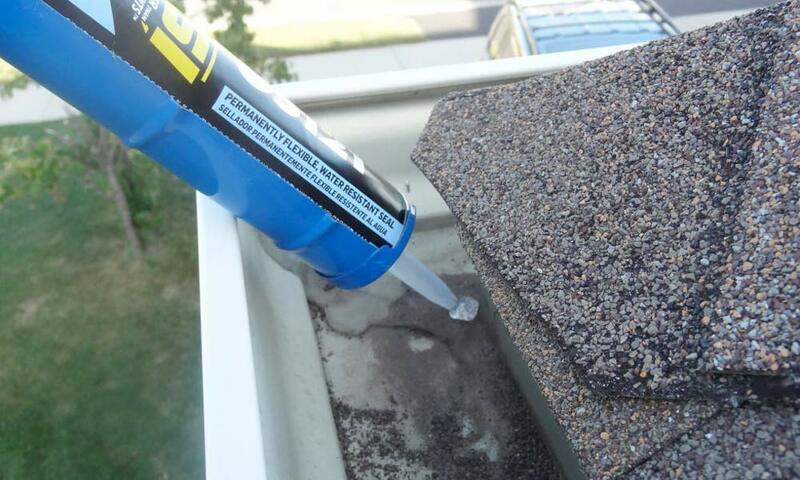 Remove any debris and peeling sealant you find between the inside of the end cap and the gutter. Wipe the area with a cloth, making sure it’s clean and dry. Now apply the sealant with a caulk gun. If the end cap is damaged – for instance, if it got knocked out of whack by a falling branch – then you’ll need to replace it. Take out any rivets with a drill, cut away the old sealant with a putty or utility knife, then tap off the end cap with a rubber mallet. Apply a fresh bead of sealant into the grooved channel on the new end cap, then press it firmly in place. 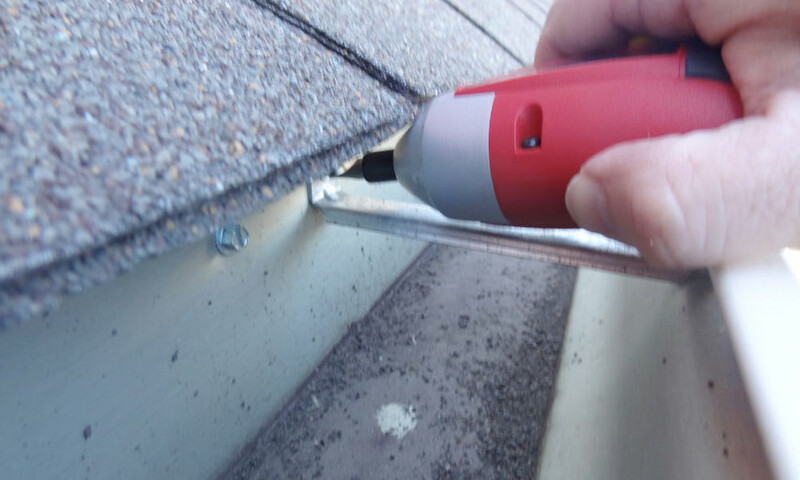 For aluminium gutters, insert a pop rivet through each side of the end cap and the gutter to lock it in place. First, make sure the seam is tight. The sections should lie flat against each other with no gaps. If there are gaps, use brackets or fasteners to adjust or reattach the sections until they’re flat. After that, the fix is the same as a leaky end cap: clean the seam, make sure it’s dry, and apply sealant. 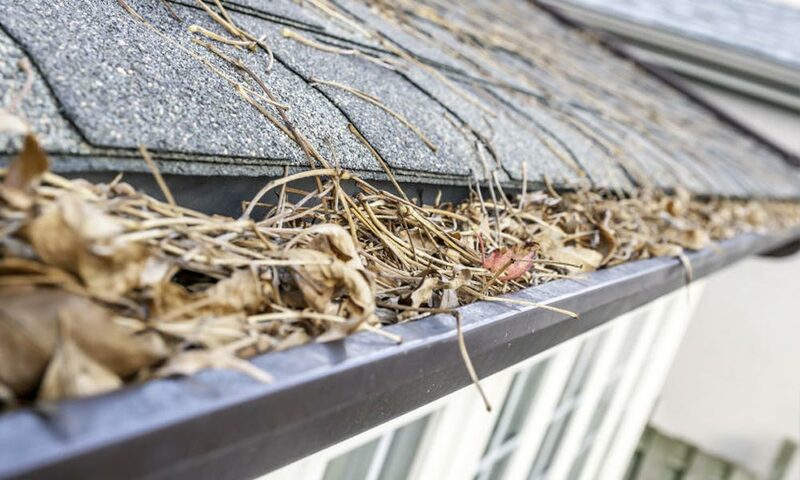 The weight of water itself can cause gutters to sag and even pull away from the house. However, hardware stores sell hangers that are made to fit different profiles of gutters. They secure the gutters tight against the fascia. Most hangers fit into the lip along the front of the gutter. The clip side fits over the gutter back. You then drive the attached screw through the hanger, gutter, and into the fascia. If you can identify where the rafters are, then place the hangers there. You’ll get more bite and strength when you drive the fastener through the fascia and into the rafter. Attach a hanger at every rafter, or every 60 centimetres, to tighten the gutters against the house and remove the sag. Downspouts play a vital role in gutter systems. They channel the water from the gutters to the lawn, rain barrel, or other location that gets it away from the house. Downspouts should be attached to the house at the top and the bottom, close to the elbows. Long runs of downspouts should have a couple attachments in the middle, too. Every now and then downspouts get knocked loose. This can cause the elbow connections to leak. Secure downspouts to the siding with clips. They screw into the siding, then you attach the downspout to the clips with screws. Attach the first clip, then make sure the downspout is straight before fastening additional ones. During heavy rains, water gushes down roof valleys with the force of a small river. With so much momentum, the water often shoots right over the gutter. 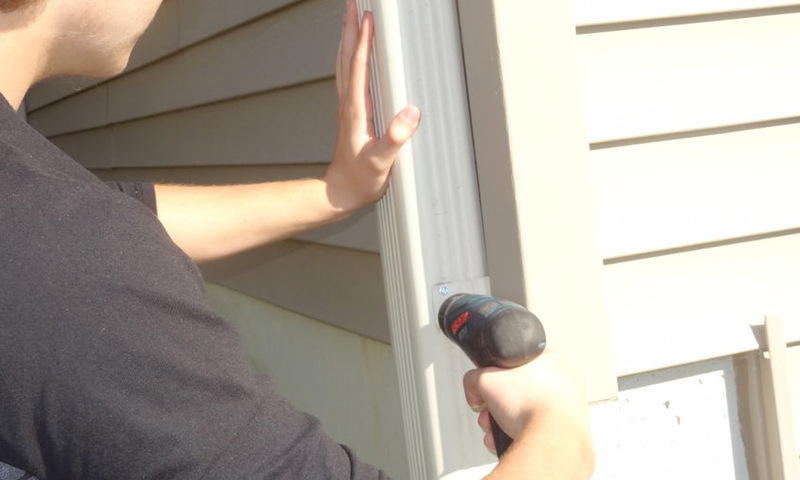 Screwing or riveting a guard along the top of the gutter at the valley will block the water from spilling over. The guards are available in different colours to match your rain gutters. Sometimes the soil under the downspouts gets washed away. This happens when water pours in one spot. A simple solution is to add downspout extensions. 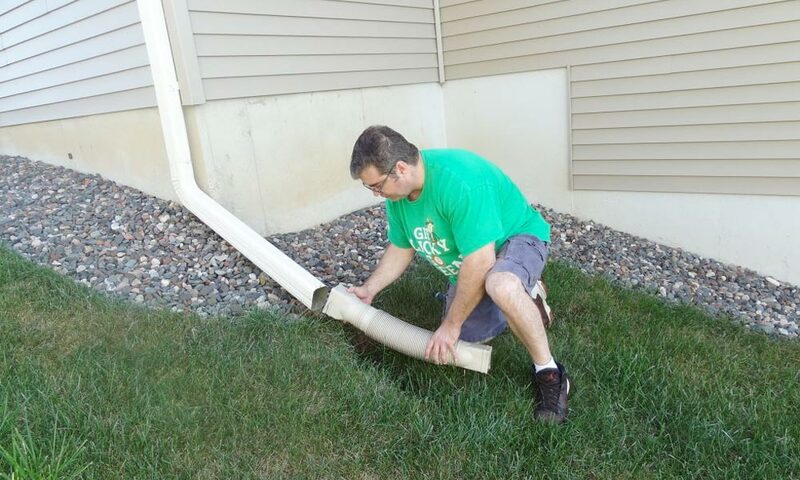 The flexible extensions snap onto downspouts without fasteners, so they’re removable when it’s time to mow. A splash block is an alternative solution that also helps with erosion. The blocks absorb the impact of the water pouring out of the downspouts, so the water flows more gently into the lawn.